Trainer Danny O'Brien had to delve into his bag of tricks to turn around the form of The New Boy, who bounced back onto the winner's list for the first time since two-and-a-half years, in Saturday's Ballan Cup at Geelong. O'Brien has jumped the eight-year-old gelding over the past three weeks leading into the event and another factor was reapplying blinkers and engaging the services of great front-running rider Darren Gauci. "The Gauc" took The New Boy straight to the lead in the 1500m feature and the rest was history as they made ever post a winner to claim the Ballan Cup. 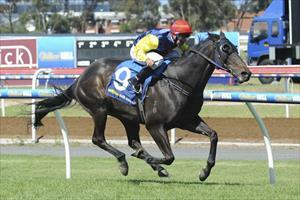 "Darren is the best front-running rider in the country and he proved it again with this ride," O'Brien said. "It's a testament to my team who have put in so much work with this horse to get him looking good, feeling well and in form and it i also great reward for his owners who love the horse and have been so patient waiting for this next win." The win in the $30,000 event was The New Boy's fifth of his career and took his earnings past $350,000.